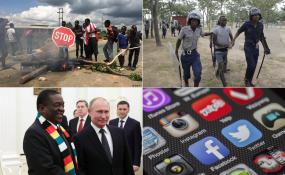 Zimbabwe: What Now After a 2nd Internet Shutdown, and Treason Charges for Activists? Cape Town — Zimbabwe's government has again forced a "total Internet shutdown", Misa Zimbabwe says, after a violent crackdown by police when huge crowds protested against dramatic fuel price increases. The country's biggest mobile operator Econet Wireless says it has been ordered to shut down the Internet nationwide until further notice. "We were served with another directive for total shutdown of the internet until further notice," Econet said in a statement. "Our lawyers advised that we are required to comply with the directive pending the court's decision on its legality." The Internet was cut off earlier, with critics saying the government sought to prevent images of its heavy-handedness in dealing with protesters from being broadcast around the world. The Zimbabwe Association of Doctors for Human Rights has said it had treated 68 cases of gunshot wounds and over 100 other cases of "assaults with sharp objects, booted feet, baton sticks" and more. Death tolls have varied. Eight people were killed when police and military fired on crowds, Amnesty International said. But the Zimbabwean government said three people were killed, including a police officer stoned to death by an angry crowd. The demonstrations amount to "terrorism", Information Minister Monica Mutsvangwa said, blaming the opposition. State Security Minister Owen Ncube thanked security forces for "standing firm." Lawyers and activists say the toll was much higher. The UK's minister for Africa, Harriett Baldwin, has summoned Zimbabwe's ambassador to discuss "disturbing reports of use of live ammunition, intimidation and excessive force" against protesters. The European Union in a statement late on Thursday noted the "disproportionate use of force by security personnel" and urged that internet service be restored. After two days of protests, soldiers and police were patrolling Harare townships, allegedly assaulting people in their homes, a tactic used by Robert Mugabe's security services during his repressive rule. Scores of Zimbabwean civilians, including prominent activist Evan Mawarire was detained and charged with public violence and treason, and others were beaten, lawyers and witnesses said, pointing to a heavy crackdown on dissent by security forces. "Please pray for Robson Chere and Mox Mbera tonight. They're in police custody in Goromonzi for a second night tonight. Last night the military came to the police station to try abduct them. They want Robson eliminated as he is one of Zimbabwe's most effective grassroots organisers," opposition activist and lawyer Doug Coltart tweeted. Chere is the Secretary-General of the Amalgamated Rural Teachers Union of Zimbabwe, one of Zimbabwe's "most action-oriented" trade unions, Coltart said. ARTUZ is a member of ZCTU which is the umbrella union which called the three-day stay away. Coltart also says Zimbabwe Congress of Trade Unions (ZCTU) president Peter Mutasa is currently missing. Mutasa and Mawarire called on Zimbabweans to embark on a strike starting January 14. Mawarire is expected to appear in court for inciting public violence. At the time, Coltart said Mutasa had not been seen or heard from. "Peter Mutasa, President of ZCTU is currently missing. No one has heard from him or seen him over the past 24 hours and his whereabouts are unknown. There are serious concerns about his safety given what's been going on in the country," said Coltart. Joana Mamombe, an opposition lawmaker, said she was in hiding after soldiers sought her out at her parents' home and beat up her father, leaving him hospitalised and unable to sit. The MDC national organising secretary Amos Chibaya was also arrested. He was nabbed when he visited arrested party members at Gweru Central Police Station some 275 km south-west of the capital, Harare. A spokesman for Zimbabwe Lawyers for Human Rights said it was representing 69 others who were charged with public violence in court. Another 13 would appear later while dozens would face the same charges in the second city Bulawayo. Police say they have arrested more than 200 people following the protests. Human rights watchdogs have voiced their concerns. In its annual "World Report", Human Rights Watch, detailed a range of areas in which it said President Emmerson Mnangagwa and other senior officials had failed to live up to "numerous promises to deliver governance reforms to mark the post-Mugabe era". "We are deeply troubled by the socio-economic crisis that is unfolding and the repression of protests, following the decision to increase fuel prices. We urge the government to find ways of engaging with the population about their legitimate grievances," the UN Human Rights Office of the High Commissioner said in a statement. The U.S. Embassy in Zimbabwe says they are "concerned". "We condemn any disproportionate use of force and call on Zimbabwe's security forces to respond to civil unrest professionally and with respect for human life and constitutional rights. We are also alarmed by credible reports that security forces are targeting and beating political activists and labor leaders," a statement said. The EU has urged the government to uphold human rights as enshrined in the constitution. Zimbabweans had hoped President Emmerson Mnangagwa would make good on pre-election pledges to revive the economy and break with the Mugabe era. But since the November 2017's military takeover that ousted Mugabe, Zimbabwe has fallen back into familiar ways. Dollar shortages are battering the economy, rocketing inflation is destroying the value of citizens' savings and the government is reacting forcefully to crush dissent. Mnangagwa, on a trip to Russia and the World Economic Forum in Davos, said he was "deeply saddened" by the violent protests. "Resolving Zimbabwe's economic challenges is a monumental task, and while it may not always feel that way, we are moving in the right direction," he said on his official Facebook page. Zimbabweans had briefly rejoiced when Mnangagwa succeeded Mugabe, who was forced out in late 2017, thinking the new president would deliver on his refrain that the country "is open for business". But frustration has risen over the lack of improvement in the collapsed economy, which doesn't even have a currency of its own.